Companies with successful environmental and sustainability programs recognize the need for these programs to be enterprise-wide. Ad-hoc efforts are difficult to scale, manage, repeat, or improve upon. Just like any enterprise-wide program, the issues and requirements of a sustainability initiative are complex and multidimensional. Processes, applications, infrastructure and operations must be aligned with the business goals and requirements. Underlying all of this is the fact that both greenness and sustainability require a robust and adaptable IT infrastructure. This chapter applies the lessons learned from effective use of enterprise architecture (EA) to sustainability initiatives. In particular, it focuses on facilitating the alignment of business visions encompassing financial, environmental, and social responsibility with processes and operational capabilities. Using an architectural approach leverages the key practices that are already in place in successful organizations to drive enterprise-wide sustainability efforts. One of the key lessons that corporations have learned in the recent past is that thinking and practicing green and being sustainable makes business sense. This is particularly so for large corporations who have shifted from significant polluters to focusing on reducing carbon emissions. For some, this emphasis on the green and sustainability phenomenon is nothing less than a complete turnaround of perception in the marketplace. There appears to be a competition to lead and champion the cause of green and sustainable enterprise. Increasing numbers of enterprises understand and accept the strategic benefits of sustainability. However, not every organization has the same issues or requirements when heading down the sustainability path. Manufacturers, healthcare institutions, and the travel industry face many of the more complex issues. Yet “cleaner” industries, such as professional associations, software companies, nonprofits, law offices, and governmental agencies, have different, but just as pressing, concerns about green and sustainability. In between these extremes, lay retailers, academia, and financial institutions. How green and sustainable can a given business operation or process be? What opportunities exist for efficiency improvements or risk elimination so that the business process is green and sustainable? What environmental regulations must an enterprise comply with? Are there any incentives, financial or otherwise, available for compliance? How green can a building or a facility be? What incentives might be available if a building or facility becomes more green and sustainable? Are our procurement and supply chain processes sustainable? How much data or information may be redundant? Will elimination of redundant data reduce storage requirements and provide better efficiency of a data center? What standards exist — or might be in development — that allow an organization to measure, monitor, and report on its levels of green and sustainability? Architecture Road Map: An enterprise wide plan that communicates how an initiative will be implemented. It incorporates priorities, dependencies, and resources to show the business drivers, domains and sub-domains (business, information, application, and infrastructure), activities, schedule, and intended outcomes. The roadmap ties initiatives to business drivers and identifies the projects, processes, systems, and technology implications. Business Motivation Model: “The Business Motivation Model provides a scheme or structure for developing, communicating, and managing business plans in an organized manner. Specifically, the Business Motivation Model does all of the following:1) It identifies factors that motivate the establishing of business plans; 2) It identifies and defines the elements of business plans; 3) It indicates how all these factors and elements inter-relate. Among these elements are those that provide governance for and guidance to the business — Business Policies and Business Rules.” (Object Management Group, 2008) (Rosen, 2008c) provides an introduction to the BMM and its benefits. Triple Bottom Line: The triple bottom line captures an increased spectrum of values and criteria for assessing a company’s performance. It expands the traditional reporting framework beyond financial performance to take into account ecological and social performance. Technology Architecture: The technology architecture describes the infrastructure required to support applications, operations, and reporting requirements. Sustainable: An enterprise is deemed sustainable if its products, services, policies, and assets are balanced across three dimensions, often called “the triple bottom line” These dimensions are: 1) Economic viability, 2) Environmental responsibility, and 3) Social equitability. Application Architecture: The application architecture focuses on what must be common across applications to meet enterprise goals. It describes how to build applications and how to use the technology architecture to achieve enterprise capabilities and consistency. Green: A green company actively reduces the environmental impact of its products or services, processes, and assets across its entire value chain, congruent with its normal operations, and it has clearly articulated environmental strategies to reduce costs and risks while also increasing stakeholder value. Key Performance Indicators (KPI): Key Performance Indicators (KPI) are indicators of an organization’s performance against a defined and measurable criteria. KPIs help measure the progress of an organization – hence, obviously, they can play a major role in ascertaining the environmental performance of an organization. The KPI can vary depending on the business and the specific goals of the business. For example, an airline may decide to have the “fuel consumed per passenger kilometer” as its KPI; and a hospital may have “carbon emission from IT instruments per patient” as its criteria. Measurable targets for each KPI are set – and then measured to ascertain success or otherwise of the organization’s performance. 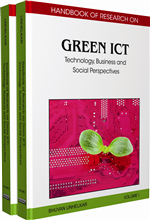 KPIs in the green ICT domain will reflect the organization’s environmental goals – ensuring that those KPIs are crucial to the organization’s success and are measurable and understood across the organization. Enterprise Architecture: The collection of all architectures, methods, and governance combined to meet specific business requirements and goals at an enterprise scope. The EA defines relationships between the specific domain architectures and how all of the different architectures relate to each other and contribute to the overall enterprise.